Just how real is the sudden importance and profitability for SaaS companies? 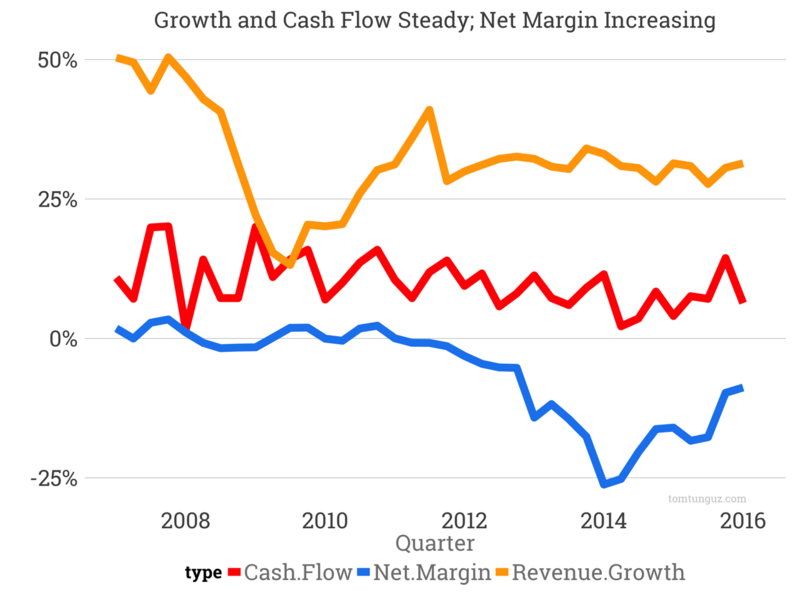 The median publicly traded SaaS company has improved net margin from -25% to -8.8% in less than two years, after a nearly four-year trend of negative growth in net margin. The initial spike in 2014 occurs two quarters after the first SaaS correction and the second occurs in late 2015. Examining the trend by quartile, we see that the 75th percentile companies operate at breakeven. 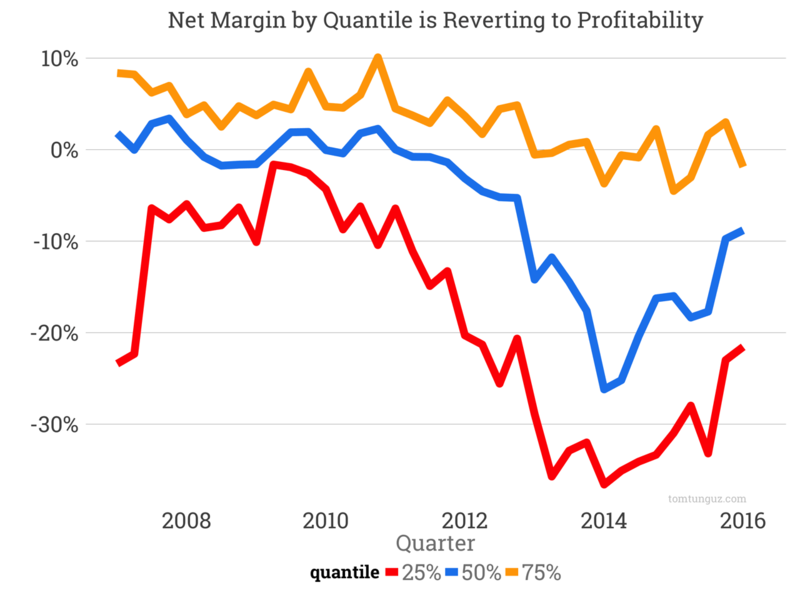 Companies in the 25th percentile and 50th percentile have been pushing profitability further and further into the red, only to reverse the trend beginning in 2014 after the first SaaS correction. So, it is the companies whose profitability has historically been worst who have been changing the way they operate. How have these changes impacted growth and cash flows? Surprisingly, very little. In the chart above, revenue growth is marked in orange and cash flow from operations in red. The median across this basket of stocks remains constant over the same time frame. 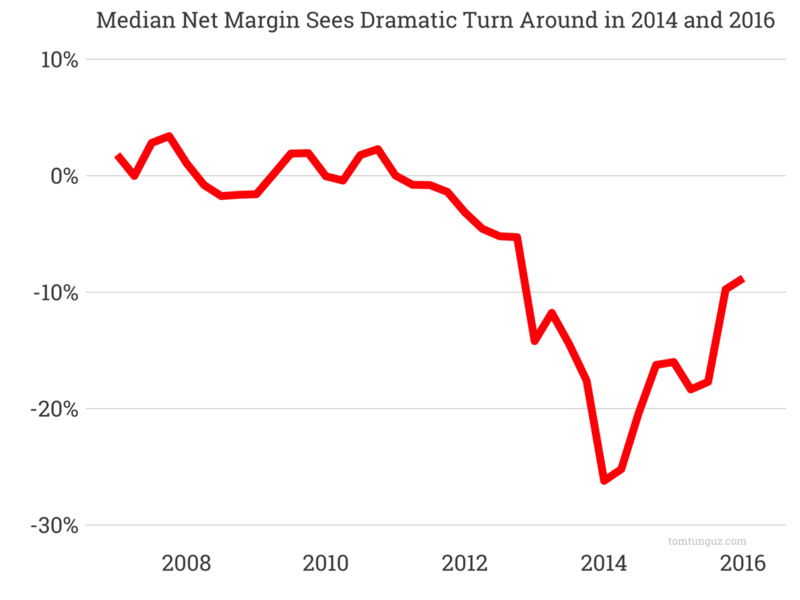 This indicates lower quartile net margin companies are changing the way they operate their businesses. The data suggests that these businesses are likely restructuring their contracts to defer less revenue, but the issued merits more research. Regardless of how these businesses are achieving these changes, the data is clear: for these companies, investors demand a clear path to profitability. How much does it matter for early-stage SaaS companies? After all, these businesses don’t have to report to public market investors. For early-stage businesses, the ability to become profitable on the company’s current cash provides founders leverage in fundraising conversations. As we have seen in the past, series A companies are typically not valued on revenue multiples, so profitability that stage is not that material. But the later stages the company becomes, the more likely investors are to evaluate similarly to public businesses. And then the path profitability influences valuation more.